The privacy of all those who use this website is of utmost importance to divorce and children, LLC. Except as otherwise provided in this document, we will not intentionally disclose any personal information regarding our users without first obtaining their approval, unless required to do so to satisfy a legal obligation. When you visit divorce and children.com or purchase products from divorce and children.LLC, certain personally identifiable information will be requested. We ask for this information for our internal use only. We use it principally to fulfill product orders and communicate with you. We also use it to help develop and improve our services to meet your needs. If you specifically and knowingly provide any personal information to us via this website, you consent to divorce and children, LLC using that personal information lawfully at its sole and absolute discretion, including for the purposes of providing promotional and marketing materials by other means. Please note that you must obtain the consent of any third person whose personal information you post to this website. Where disclosure is reasonably necessary to protect divorce and children LLC rights or property. You can register with our web site if you would like to receive our e-mail newsletter as well as updates on our new products and services. These updates include notices concerning products, special offers and promotions from divorce and children, LLC and our affiliates. We will do our best to make your experience at divorce and children.com positive. However even though we may be diligent, we cannot always foresee or anticipate technical or other difficulties. These difficulties may result in loss of data, personalization settings or other service interruptions. For this reason, you agree that the services provided by divorce and children, LLC are provided “as is” without guarantee. divorce and children, LLC cannot assume responsibility for the timeliness, deletion, misdirected delivery or failure to store any user data, communications or personalization settings. divorce and children, LLC reserves the right to change or discontinue, temporarily or permanently, its services at any time without notice. You agree that divorceandchildren, LLC will not be liable to you or any third party for any modification or discontinuance of the Service. By submitting ideas, resources and other content via email or message boards or any other forum, you automatically agree that, without any particular time limit, and without the payment of any fees, that divorceandchildren, LLC may reproduce, display, distribute and create new works of authorship based on and including the Content. We will exclusively own all known or later-existing rights to the Content or any other Submission of Creative Work worldwide, and will be entitled to the unrestricted use of said Content or Submission for any purpose, without compensation to the provider. Users of this site are expected to behave with respect and consideration for others. divorce and children, LLC does not ordinarily filter, censor, edit or regulate information and content provided by third parties on this website, including any such information provided in interactive areas, and we neither endorse nor are responsible for (and under no circumstances shall be liable for) the contents, accuracy or reliability of such information and content. When participating in interactive portions of this website, you represent that you have proper right and authorization to use any information or content you upload or post and agree to abide by the following code of acceptable conduct: You will not upload or otherwise provide infringing, defamatory, obscene, pornographic, threatening, abusive, illegal or otherwise improper content. You will not upload viruses or harmful components. You will not use the website to further any illegal purpose or to violate the rights of any party. You will not upload or otherwise provide content with a commercial purpose or attempt to solicit funds or advertise goods and services. If divorceandchildren, LLC learns of communications that may be unlawful or harmful to other users or to the site, or that impinge upon the rights of other users or others prohibited communications, we will take appropriate action. We may delete any communication that we deem to be spam or inappropriate and may send you a warning and/or terminate your ability to utilize this site. divorceandchildren, LLC receives and replies to email from users on a regular basis. For record-keeping purposes we retain copies of most email sent to us. We do not anticipate that the information in the email we receive or send will be disclosed to any third party without the permission of the sender, either express or implied, unless required or necessary as specified in the previous paragraph. The information contained in the video programs and or resource materials offered through the divorceandchildren, LLC in our online store or on our website are true and accurate to the best of our knowledge. 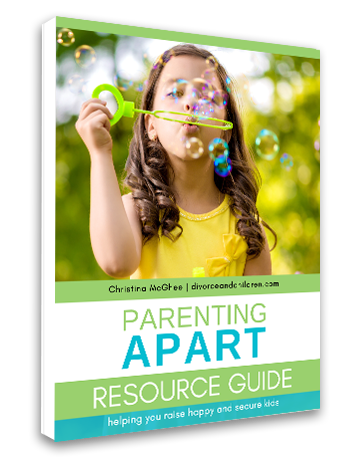 These products are intended only as educational and informational resources for parents and children experiencing separation or divorce in their family. In no way are any of the listed products intended to replace or conflict with advice given by a mental health professional, counselor, mediator or a lawyer. Decisions concerning families should be made by parents in consultation with their own professionals. Information offered by our online products is general and is offered with no guarantees on the part of the authors. No part of any DVD program or resources materials may be reproduced, stored in a retrieval system, or transmitted, in any form or by any means without the written permission of divorceandchildren, LLC. Additionally divorceandchildren, LLC explicitly disclaims all liability from incidents arising from the imitation, copying, misuse, abuse of, or any other incident arising from concepts and content offered by products listed on divorceandchildren.com. For products that have been designed for children, we encourage parents to view, read and or participate with your child/children in viewing these resources and to discuss the information with your child/children. If you have any comments please feel free to contact us at info@divorceandchildren.com . Please feel free to contact info@divorceandchildren.com if you have any questions, comments or would like more information concerning our terms and conditions.